As I was walking past a housekeeping storage room at a hotel, I couldn't help but notice that the storage locations were marked on the shelves (click on the photo for a larger view). As you can see in the picture, they labeled not only “what” goes where, but “how many”, which is a key point for 5S-ing stock shelves and locations. 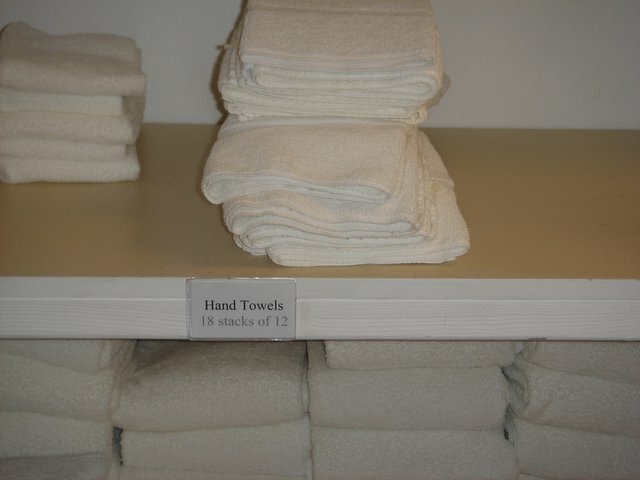 In addition to boundary lines, vertical “Quantity Lines”, in red/green placed behind the towel stacks would show qualities without having to count towels.